Hilarious development in child-rearing over the past few days. Over the weekend, John had a hankering for Legos. He pulled up the Lego website and developed a serious case of what my mom used to refer to as the “I wants.” To get the Legos, John needed to figure out how to generate some income. My good friend Susan had already provided the solution. 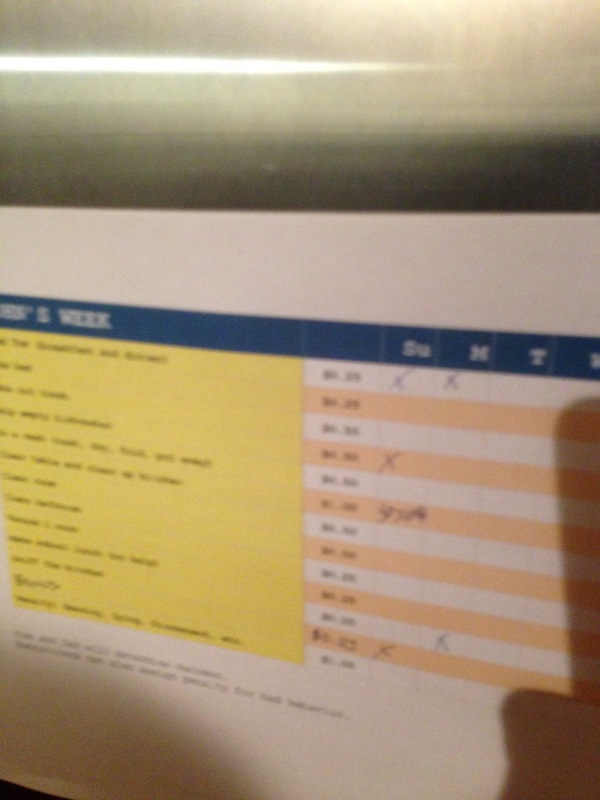 She recently sent me the chart that she uses with her girls to keep track of the chores they do and what they’ll earn for each one. It’s not a lot of money, but it gives them some control. The tie between effort and reward hasn’t been compelling to John when I’ve talked to him about a regular weekly allowance. The chart, on the other hand, was a hit. On day one, John washed the kitchen floor, vacuumed the den, cleaned his room, and made his lunch. On day two, he helped empty the dishwasher and did the kitchen floor again. He has completely taken over feeding Tom twice a day. I’m sure the novelty will wear off, but for now it’s going great. Here’s the part that has me laughing. Sunday was Matt’s birthday, and John cleared the table and did all the dishes. And because it was a birthday dinner: he gave us a 50% discount. P.S. Because I just know there are people who will read this and think that kids should do chores because they should and not because they’re getting paid: I get it. I agree. We have those things, too. They just aren’t on the chart. March 11, 2015 by Katie J.